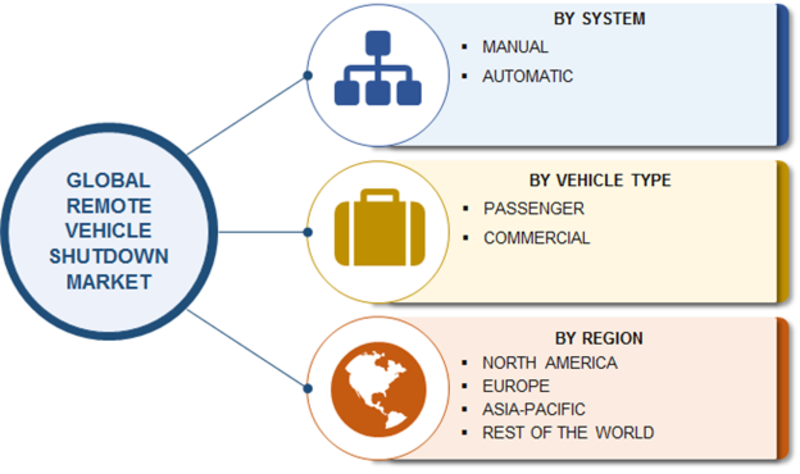 Tracknstop recently featured as a key player in the Market Research Future Global Remote Vehicle Shutdown Market Report by System (Manual and Automatic), By Vehicle Type (Passenger and Commercial) and By Region - Global Forecast to 2023. The rise in vehicle and cargo thefts, has elicited the need of automated systems, which helps in securing the vehicle or the cargo. Despite being equipped with security systems, such as complex electronics and alarm systems; the transportation industry is witnessing huge losses due to the thefts and thus, is at a vulnerable state. Remote immobilization proves to be a feasible solution to prevent vehicle theft and helps in retrieving valuable goods and cargoes from stolen vehicles. Remote shutdown device helps prevent possible hijacking and thefts, by burglars. Remote shutdown devices have systems, connecting the car with a possible manual or automated operator through satellite and wireless connections. The device is mainly connected with the car through the central circuit; by a transmitter and receiver, which receives signal, either to reduce the speed of the vehicle or to shutoff the engine entirely. The usage of such devices can be found in the U.S, where subprime auto loans are given by lenders. Thus, lenders use this technology to disable ignition of a car when a borrower fails to repay. Moreover the police department also use remote vehicle shutdown technology to remotely halt high speed hunts and to find stolen cars. With the development of multibillion dollar logistics and transportation industry, the concern of safe and timely deliverance of goods and cargos is increasing. This has propelled the industry to adopt remote vehicle lockdown device for their safety and has increased the demand for remote vehicle lockdown devices. The remote vehicle lockdown devices are currently being integrated with a comprehensive security devices, which provides complete vehicle security such as GPS tracking and anti-theft security alarm. Auto manufacturers are investing heavily into the development of advanced technologies to keep vehicles safe. Multinational Corporation such as General Motors and Scania AB are actively involved in the development of such technology. However the concern regarding privacy and instances of vehicle and personnel damage due to engine lockdown, is raising issues regarding the use of remote vehicle lockdown device. The global remote vehicle shutdown market is expected to grow at ~ 8% CAGR during the forecast period. Currently, the remote vehicle shutdown market is in the growth stage. This is due to the increasing concerns of the safety of vehicles over the forecast years. The growth is primarily attributed to their high applicability in the automotive industry, which is likely to continue during the forecast years. The North American region is currently the leading region in Remote Vehicle Shutdown market and is followed by Europe and Asia Pacific. The key players of global remote vehicle shutdown market are PassTime GPS (U.S), OnStar Corporation (U.S), Cobra Car Tech Ltd (U.K), Sonic Electronix,Inc (U.S), LoJack Corporation (U.S), TracknStop (Ireland), The Tracker (South Africa), Fleetsmart (U.K), Frotcom International (Portugal) and EMCO Software (Iceland).